For this new table display (suitable for tables inside and outside) functionality, brand experience and design are melted together, which results in a very attractive product. Last year’s designed table display is given a new look, once again by CQ. The assignment was to develop a more durable version. CQ knows that a new product must be a collection of innovative and creative features. 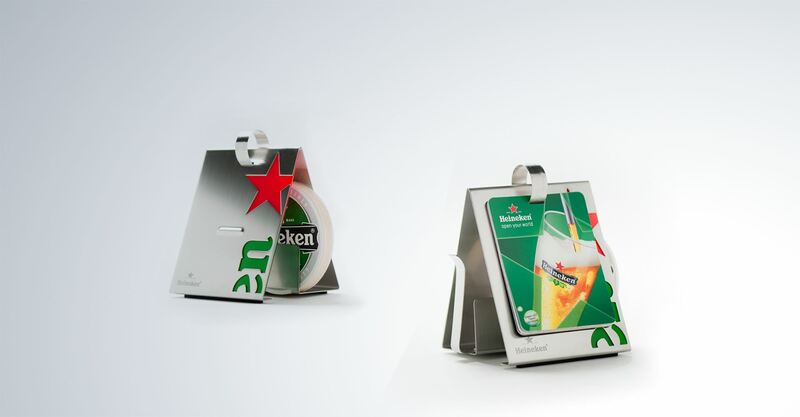 This resulted in two new versions: one for Heineken, made of brushed stainless steel with plastic printed cards and a second version for Amstel, which is red coated. The renewed versions are less vulnerable and heavier in weight. Some extra benefits, like extra storage options for coasters and menu cards, are added next to the basic display which shows different kind of available beverages.